The motherboard is the foundation for everything your PC is and does. It defines not only its current functionality and long-term viability. It also has a huge impact on performance. With that in mind, this motherboard mélange is a snapshot of the best currently on the market in terms of AMD-compatible boards. The good news is that the choice is simple. For starters, the CPU socket is a no brainer. If you're building a new PC, you want AM3. Likewise, the number of relevant chipsets is on the wane. Since AMD bagged ATI, AMD has become arguably the only major player in performance desktop chipsets that is compatible with its own CPUs. Yes, Nvidia still has the nForce 980a SLI. But not only is that chipset well over a year old, the northbridge chip at its heart is a rebadge of the even more ancient 780a SLI. It's not clear what Nvidia's plans are for the future of its AMD chipset business. But currently if you want a modern and up to date mobo, AMD's latest 8 series chipsets are where it's at. As for which specific chipset and board to go for, it all comes down to use. Intriguingly, dual-link DVI is now available with some integrated boards based on the 800 series. This means you can drive a 30-inch panel without the need for a discrete video card. That is, if gaming performance isn't your number one priority. Finally, storage and peripheral bandwidth are increasingly important. Most AMD 8 Series mobos support SATA II 6Gbps. However, USB 3.0 isn't native to the 8 Series and support depends on mobo makers adding a dedicated controller. Certainly something to look out for. 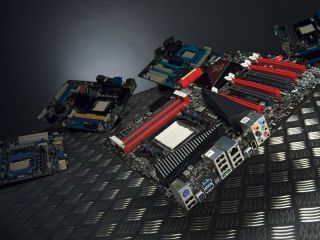 Read on to discover the best AM3 motherboard for 2010. Fact: When it comes to CPUs, AMD makes cheapo chips. Would it prefer to sock it to Intel at the more profitable end of the market? You're damn tootin', it would. But until its all-new Bulldozer processor rocks up next year, AMD is stuck peddling a geriatric CPU architecture that dates back to 2003. In our minds, then, PCs based on AMD technology are all about maximum performance in return for the minimum outlay. That means paying as little as possible for a motherboard. By that rationale, Asrock's 880GMH USB3 should be our default winner. What's your take on integrated GPUs? When it comes to gaming, integrated graphics is obviously in no-touchy territory. But it gets the job done just fine for 2D or home cinema work. Likewise, onboard graphics is a handy backup should your 3D card lose the will to render. However, if you're building a gaming or content creation rig on a tight budget, paying for the redundant circuitry doesn't make sense. What you want is a no-nonsense motherboard that ditches the feeble integrated GPU and only gives you what you need. What you want is MSI's 870A-G54. Right? That's an affirmative, on paper at least. Are you ever likely to run two AMD video cards in multi-GPU CrossFire mode or use a second graphics card as a physics or GPGPU accelerator? The honest answer is: it's unlikely. What you probably don't need, in other words, is a full sized ATX mobo with a silly number of PCI-e slots. A micro-ATX board with a single graphics slot and some enthusiast-friendly features will get the job done just fine. Enter, MSI's 880GMA-E45. Powered by AMD's middling 880G chipset, it's bang up to date and offers enough power features to keep most enthusiasts happy. Asus is the name, impossibly slick motherboards is the game. Even this modest M4A88TD-V Evo model is still quite a looker. For starters, like nearly all Asus boards it's immaculately arranged. Wherever possible, components are positioned in near-perfect little rows. It must make motherboard engineers from other companies weep onto their MOSFETs. Then there's the natty blue-and-black colour scheme and expensive heatsinks for the northbridge and voltage regulation circuitry. It's nearly enough to make you assume this is a fine board without dissecting the details or seeing the benchmarks. Nearly enough, but not quite. The number of PC component manufacturers appears to be on the wane. The whys and wherefores are not entirely clear but probably have something to do with the recent financial crisis. That and the general process of consolidation, which most maturing industries experience. Less choice is never a good thing, so we're fully in favour of having as many players on the scene, even if some are rather, well, occasional, such as Sapphire. The outfit behind some of our favourite ATI Radeon-based graphics cards, Sapphire offers a modest collection of both Intel and AMD compatible boards. For now, it offers a single AMD 8 Series model, the PURE CrossFireX 890GX. Stuffing ever-more features and functionality into chips. That's what computing is all about. In the past, ever-increasing transistor counts have enabled the likes of Intel and AMD to make their execution cores more sophisticated, perhaps bolting on extra cache memory or maybe bunging in a floating point unit or three. More recently, chip engineers have spent their transistor budgets by cramming in more cores. But arguably the most significant current trend is the drive towards SoC or system-on-a-chip designs. In the context of the PC, that means taking bits off the motherboard and sticking them into the CPU. Bits like the memory controller, I/O and integrated graphics. The point is that you could argue that mobos are becoming less and less critical. The end game seems to be a dumb board with a few sockets that does little more than connect components and supply power. A high end board for mid-range money, what's not to like? That's what Asrock hopes you'll think when you clock the 890FX chipset and a £125 sticker. But does this performance-orientated board deliver? If you're in the habit of tag-teaming multiple graphics cards, Asrock has the bases covered with a trio of PCI Express graphics slots and has gone to town on the northbridge and MOSFET cooling, too. It's an active arrangement with a fan on the MOSFET cooler connected to the Northbridge via a heat pipe. The only slight downside is that it does impinge a little on space around the socket. That said, it is removable. There's still something particularly perverse about paying more for a motherboard than a CPU. For high-end Intel chips approaching £1,000, that's not a problem. But almost all of AMD's processors can be had for less than £150. At £170 this Asus uberboard is therefore more expensive than a six core Phenom II X6 1055T. Put simply, the Crosshair IV Formula needs to be special. Fortunately, it is. Predictably, the chipset is AMD's flagship 890FX discrete graphics offering. Headline specs start with a grand total of 42 PCI-e 2.0 lanes.